There’s nothing like a great party. When you bring people together in a safe and fun environment, great things happen. Friendships and connections are built, advice and opportunities are traded, and great stories are told – and made. No matter what your next party is celebrating, kicking off, of saying goodbye to, here are a few ways to make it memorable in all of the right ways. Fun parties can look very different. A cocktail reception before an opera can be a fun party, and so was that kegger your frat threw during pledge week. But fun parties always have a few things in common. The perfect guest list. A good party has a great guest list. That means everyone at the party should know at least a few people in the room (besides you), but that nobody should know everyone. This creates the right dynamic for people to be comfortable but also sociable. Another thing to consider: don’t overwhelm your party with guests from one sphere (work, for instance), or guests of one gender, or guests of one interest, or – well, you get the idea. The perfect food and drink. Your party’s menu should match the time of the event and the time of the year, as well as the location of the event. A backyard party in summer at dinnertime? That’s a barbeque, my friend. An evening party in winter? That’s a place for desserts and booze. In fact, almost all parties could use a little booze. Head to the liquor store and grab a nice selection, because you don’t know what everyone drinks. And have some non-alcoholic options, too, as not everyone drinks alcohol. The perfect location. You don’t have to host your party at home! You can head to the local part, rent space at a bar or restaurant, or even book a big convention hall. If you do host at home, choose the rooms you want to center the party in and prep them. Move furniture to make space or encourage conversation, and consider relocating fragile items that guests may accidentally break (or may fear breaking – nobody wants to party in a china shop). Most people can’t have fun in a tense or unsafe environment. And even if they’re unaware of the dangers or don’t care about them, an unsafe environment can still ruin a party in the worst possible way: with injury or even death. So make safety a priority at your party. Fortunately, parties aren’t exactly dangerous places. Your concerns for safety at a party are pretty limited. Here are the things to consider. Food and drinks: allergies and illnesses. If you’re having food at your party, ask guests ahead of time about allergies and their seriousness. While guests with really dangerous allergies will usually make that clear on their own, it never hurts to ask. And if a person at your party has a serious problem with alcohol, getting him or her to attend may require you to ditch the booze. Getting home safe. Speaking of alcohol, how are your guests getting home? City slickers may be able to rely on subways and buses, but the rest of us will likely see a lot of guests arrive by car. Make sure nobody leaves your party with the intention of driving drunk. Have guests part somewhere that will allow them to leave their cars overnight if necessary, and have phone numbers for car services, taxis, and other options available. It wouldn’t hurt to have the guest room available, either. Make sure that your guests know you care more about their safety than about embarrassing them. There’s nothing wrong with having a few drinks, but there is plenty wrong with driving drunk! The perfect party is a party that works all on its own. It requires little of you on the day of the event – it proceeds inevitably from the planning you’ve done. 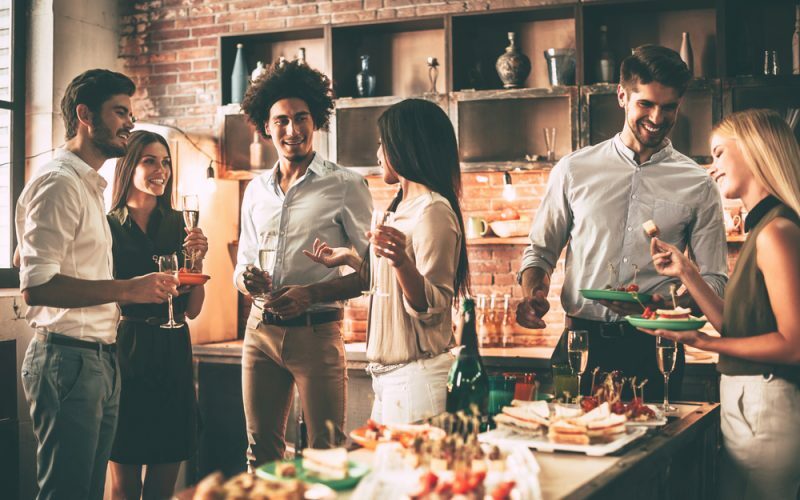 So prepare a safe environment and plan the right party in the right spot with the right food and drinks, and then send out invitations to a great guest list. The perfect party will take care of itself.